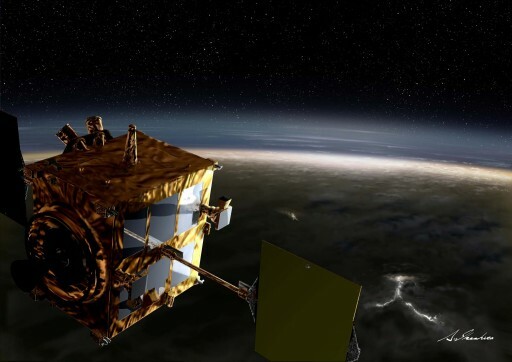 Update: The Japanese Akatsuki Venus probe conducted its orbital insertion maneuver Sunday night, five years after missing its orbital insertion slot due to a technical fault in its propulsion system. Having lost the use of its main engine, the spacecraft had to fire four of its Reaction Control System thrusters for an extended period of time. The 20.5-minute burn started at 23:51 UTC and was successfully completed, as seen in telemetry from the spacecraft. Doppler tracking has also shown a change in the spacecraft’s velocity. However, it will take up to three days of ranging measurements to confirm whether Akatsuki reached its planned orbit. Japan’s Akatsuki spacecraft, also known as the Venus Climate Orbiter, is gearing up for its second and final chance to enter orbit around Venus after missing the planet in 2010 due to a problem with the craft’s propulsion system. Its main engine rendered useless, Akatsuki will rely on its small Reaction Control Thrusters on Monday when conducting an orbital insertion maneuver lasting over 19 minutes, the longest burn ever conducted by the vehicle’s small thrusters. 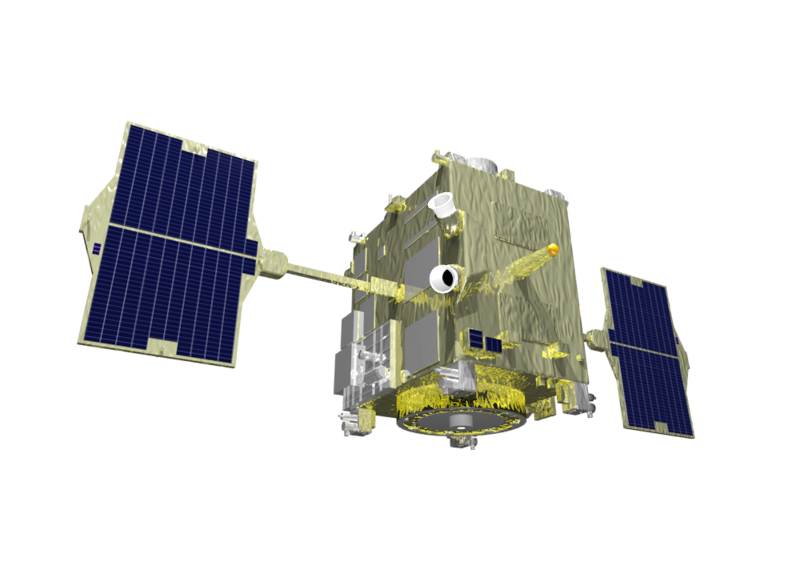 Akatsuki (‘Dawn’) embarked on its journey through the Solar System on May 20, 2010 with a successful launch atop an H-IIA rocket. The spacecraft set out study the dynamics of the atmosphere of Venus with particular interest in the upper atmosphere’s super rotation and the three-dimensional motion in the lower atmosphere, using a suite of six instruments comprised of five multi-band imagers covering the ultraviolet, visible and infrared wavelengths and a radio science experiment. In most planets, the atmosphere circulates slower than the rotation period of the planet, but on Venus the picture is reversed which is one of the items to be studied by Akatsuki. The spacecraft had a launch mass of 518 Kilograms, consisting of a 1.6 by 1.6 by 1.25-meter platform with two solar arrays with 1.4 square meters of solar panel area and a 1.6-meter diameter high gain antenna for communications with Earth. Communications at low data rates are provided by a pair of Medium Gain Antennas and two Low Gain Antennas. The solar arrays deliver 1200 Watts of power to the spacecraft and its payload which amounts to a total mass of 34 Kilograms. The instrument suite is comprised of two 12 x 12° infrared imaging instruments, the first covering the 0.90, 0.97 and 1.01-micrometer wavelengths while the second is sensitive at 1.73, 2.26 and 2.32 microns. These cameras will be able to complete imaging of the deepest levels of the dense Venusian atmosphere up to the middle and lower atmosphere at the longer wavelengths. For cloud top mapping, a 12.4 x 16.4° Longwave Infrared Camera at 10 microns will be employed while the Ultraviolet Imager will also look at the cloud tops and associated motion at wavelengths of 263 and 365 nanometers. A Lightning and Airglow Camera with a 16 by 16 ° field of view will be used to capture airglows and lightning on the night side of the planet at wavelengths of 551, 553, 558, 630, and 777 nanometers. 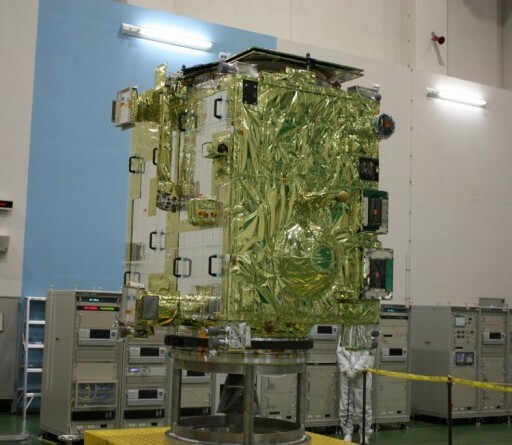 The spacecraft’s instruments will be employed to map the high and low-altitude cloud patterns, measure the distribution of water vapor and carbon monoxide, and image the surface of the planet in the search of active volcanoes using the infrared imagers of Akatsuki that can peer through the thick clouds of the planet to detect the surface. Sulfur dioxide, a precursor to cloud formation, will be mapped with the ultraviolet imaging system and radio waves sent from Earth will be directed through the atmosphere to study its structure by looking at changes introduced into the signals. 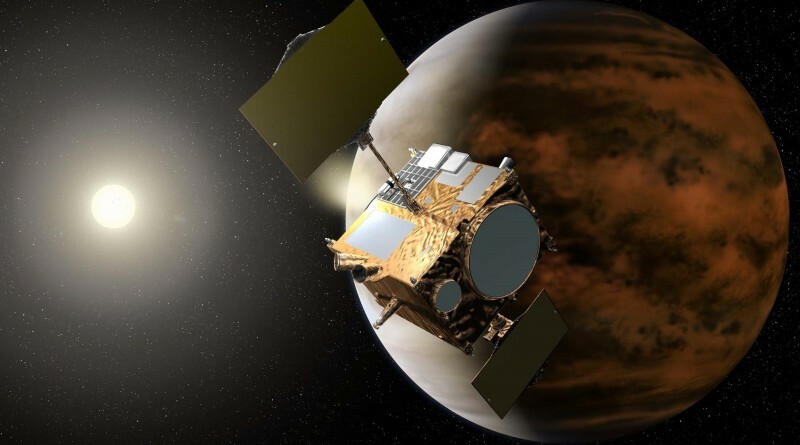 After launch, Akatsuki was set for a half-year journey through the solar system for an arrival at Venus on December 6, 2010. The spacecraft ignited its 500-Newton main engine as planned for a 12-minute orbit insertion maneuver aiming for an orbit of 550 by 180,000 Kilometers. Shortly after ignition, the spacecraft vanished behind the planet, creating a communications blackout. When the spacecraft emerged again, telemetry showed it had entered a safe mode less just 152 seconds into the orbit insertion maneuver, not having achieved orbit and drifting away from Venus. Analysis of data gathered during the burn showed that the pressure within the fuel tank of the spacecraft began dropping, creating an oxidizer-rich environment within the bipropellant main engine, consuming Nitrogen Tetroxide as oxidizer and Hydrazine fuel. Receiving an oxidizer-rich mix caused the engine to exceed its operational thermal margins, leading to structural damage and an emergency shutdown of the engine. JAXA determined that a faulty check valve between the Helium pressurant tank and the fuel tank had jammed and no more pressurization was available within the fuel system. As a root cause, JAXA suspects that a build-up of salts led to the jamming of the check valve. With the spacecraft heading back out in the inner solar system, JAXA began evaluating recovery options. A pair of calibration firings were completed with the Orbit Maneuvering Engine in September 2011 and showed the engine only achieved about 10% of its normal thrust as its throat was likely completely destroyed. Without the main engine, the Akatsuki spacecraft could only rely on its Reaction Control System that is comprised of eight 23-Newton engines and four 3-Newton thrusters. Because these thrusters only use Hydrazine monopropellant, the remaining 65 Kilograms of oxidizer were dumped overboard to lighten the spacecraft – giving the smaller thrusters more ability to control the vehicle. A set of three trajectory correction maneuvers were conducted in November 2011 for a total change in velocity of 244 meters per second to set the spacecraft up for a rendezvous with Venus in December 2015. To endure its extended mission until the second orbital insertion attempt, the spacecraft was placed in a spin-stabilized hibernation mode. Because of its close proximity to the sun, the spacecraft had to withstand thermal environments it had not been designed for, leading to degradation on electronics, batteries and thermal insulation blankets. Four trajectory correction maneuvers were conducted in 2015 to fine-tune the craft’s path towards Venus and the Mission Team was pleasantly surprised to see that the degradation on the spacecraft was less severe than expected. 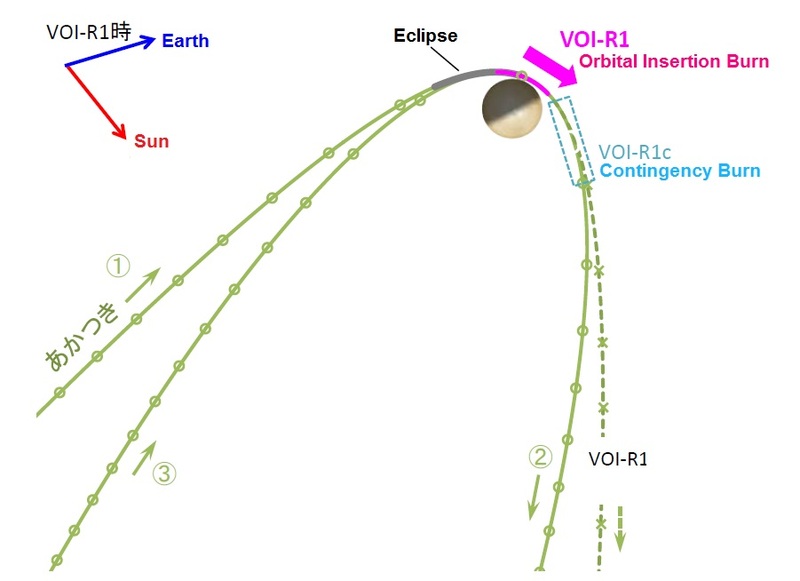 On Sunday at 23:51 UTC Spacecraft Event Time, Akatsuki will ignite four of its eight 23-Newton thrusters for an exceptionally long burn of 20 minutes and 30 seconds, centered around the close passage of the spacecraft at a distance of 550 Kilometers to Venus. Previous burns of the Reaction Control System had durations up to ten minutes, and the team is optimistic this maneuver will be successful. Nevertheless, Akatsuki will immediately turn to Venus after the maneuver and operate its five cameras to collect at least some data in case the maneuver failed. Because the smaller thrusters can not get close to the performance of the larger main engine, Akatsuki can no longer reach its originally intended orbit and will have to conduct its observations from a highly elliptical orbit, starting out in a 15-day orbit with a 500,000-Kilometer apoapsis to be reduced to a nine-day orbit in March aiming for a 320,000-Kilometer high point. The planned orbit was 300 by 79,000 Kilometers with a period of 30 hours. Two years of observations are planned from this orbit with close observations around the periapsis passage of the spacecraft and global measurements when the spacecraft is farther from the planet. 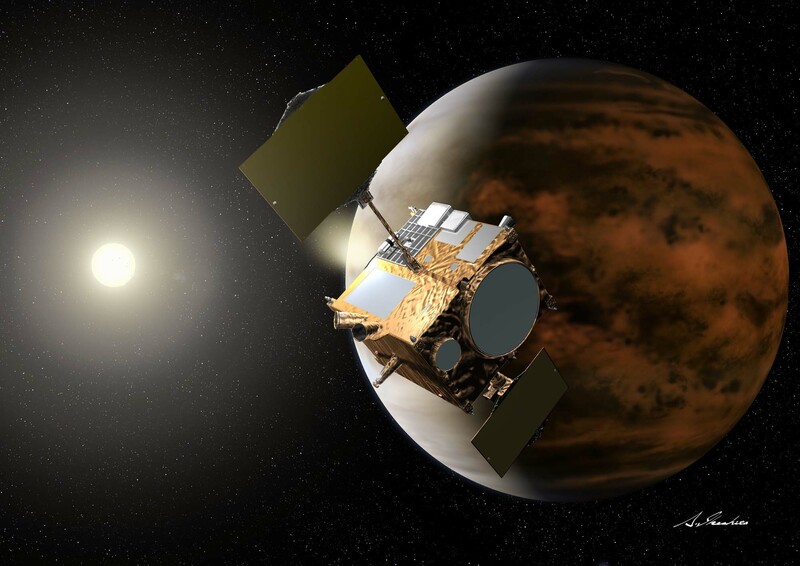 Originally, Akatsuki was expected to conduct coordinated measurements with ESA’s Venus Express spacecraft, but Venus Express ran out of fuel in late 2014 and re-entered the atmosphere early this year which will make Akatsuki the only active spacecraft in orbit around Venus – pending the successful completion of Monday’s maneuver.